Foreward: note that all the information written here is based on my understanding/memory of the Nekrophants from talking to ONN about it. As such this may not be 100% accurate or have all the little details, but it is the basic idea of the Nekrophants based on my knowledge of them. The Nekrophants are a faction of humans unconnected to the Imperial Republic. Several centuries/millenia ago, humanity was united under a massive empire known as the [insert name here]. The Western portions of the old empire are roughly in line with the heartland of the Imperial Republic (IR) while the Eastern portions were further towards the periphery, far from the Colseran border*. 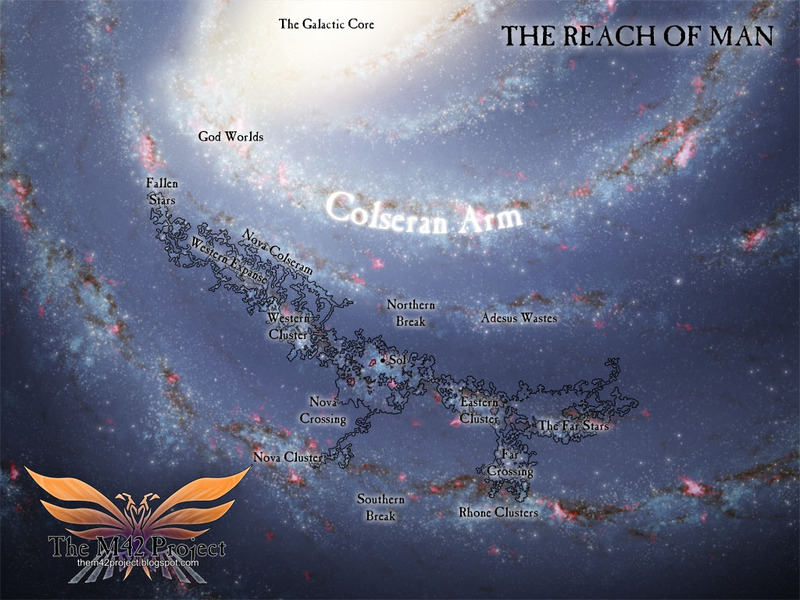 Although isolated from the Colserans, the eastern segment had to deal with large numbers of smaller alien species around their borders constantly trying to encroach on human territory. Due to the need to cover such a wide border, the Eastern military quickly overspread itself and began developing clone/vat grown soldiers to bolster their ranks. The Western half viewed this as heresy, believing that the technology should only be used by the church to create prophets. I had originally been thinking of having some sort of comprehensive history of mankind. With this empire led to that one kind of stuff. But lately I've decided that it would be much more interesting to take a more mythological approach to humanity's history. Something more biblical in nature that hints at various possible interpretations. Without getting too wrapped up in being 'accurate' or even wholly consistent with itself. Something that would include names and such that we would recognize. But whose interpretation had turned fanciful with age. After all, 40,000+ years is a long time, and we barely have an inkling of what the Egyptians were up to 6,000 to 8,000 years ago. Mostly we just have assumptions and snippits of writing that we try and intemperate as best we can. But there's all sorts of strange artifacts floating around from 10,000 or more years ago that we just don't have a clue about. Some of them are maps of places inaccessible to us now, or advanced mechanical devices that don't quite fit the mainstream historical timeline. Plus there's all those sunken cities that we're only now able to explore with remote submarines. So we can play with the history, and 'reveal' things that would be 'hidden' to us now. But not maybe to scholars 10,000+ years from now. More on that when I finish the "3rd Age Of Mankind" introduction that I'm working on. Combined with the other cultural differences between the two halves of humanity** the west evetually launched a crusade against the east, already exhausted from constast fighting with the aliens on their borders. This attack took the east completely by suprise and they quickly lost most of their territory to the west, including their capital world of [insert name here]. After the conflict the territory of the east was slowly lost and taken over by the various races that had previously surrounded it, eventually becoming [the alien federation, I'm not sure if ONN told you about that yet]. The survivors of the crusade fled further east, into as of then unclaimed space. I really don't want to focus on the fighting within the IR too much. As the real drama should be between the Colserans, The Imperial Republic, and the Gruin. The IR is getting squeezed between the two. To the 'east' lie the human worlds that border Colseran space. Which we'll call the 'Fallen'. They're aligned with the Colserans, but don't yet share their culture or most of their technology. When the Colserans fight the IR, its mostly through their Fallen proxies. While something else is directing the Gruin in the 'West'. Weakening the IR just enough to prevent them from decisively winning against the fallen. But not too much. While a third mysterious force seems to be drawing the Turids to certain places in all the empires. So while the IR will have various houses, and the Fallen their various kingdoms, let's not get bogged down in describing those. Unless it helps to illustrate the wider conflicts. Although in the IR the crusade typically receives little more than a footnote or passing mention among the various religeous wars fought throughout its history, the survivors of the east have never forgotten. In the intervening time since the crusade they have slowly rebuilt themselves as the Nekrophants, the Scions of the Dead. While establishing a small empire within the far eastern territory and rebuilding after the loss of their homeland, their feelings of shock and betrayel towards the west simmered and grew into hatred and a desire for vengeance. After several centuries of reconstruction they eventually launched a grand invasion to reclaim their old territory and to seek retribution against the west, now having been reorganized under the IR. This faction sounds like a good candidate for Colseran 'assistance'. Think CIA running guns/money to a small 3rd world country. So that they can fight a war on the CIA's behalf against a 3rd party. The Colserans don't want to get their hands dirty, and are bad at undertaking large-scale operations themselves (too fractured a society). So they work through others when they can. Best modern example would be NATO giving assistance to Georgia (the small eastern European country), and telling them to go taunt Russia by invading/claiming South Ossetia. Russia wasted no time, sent in the troops, and put Georgia back in its place. Before their exodus, the east was organized into a series of corporate royal houses that vied for economic and politcal control with each other. Although most of the houses were destroyed during the crusade, a handfull of them were able to escape and lead to the reconstruction of the empire. The three most notable of these were: House Asklepios, specializing in biotechnology and a major player in the decision to begin creation of artificial soldiers; House Pyrkaloi, a defense and weapons manufacturer; and House Phlogistos, an energy corporation that was one of the initial pioneers of fusion energy in [previously united human faction]. How about we change this, so that the 'rightful rulers' ran to the Colserans. They want to reclaim their 'homeland' which is now under republic control. The details should be both deeply embarrassing to the IR, and hit some Colseran hot buttons (Democracy! Choice! Freedom! Equality!). While the 'rightful rulers' are um... less than angelic in how they wage the war. Think Rigel from Farscape. The influence of these houses can be seen in the weapons used by the military of the Nekrophants. Unlike the IR who base their weaponry on lasers or conventional ballistics, the Nekrophants' arsenal is almost exclusivly based on plasma or incindiary weapons such as Hoplotes plasma rifles, the Palinton incindiary mortar, and the Pyr-Hippikon flamethrower tanks. Other materiel includes the Helepolis assault gun and the Kastakopos recon vehicle. Furthermore, Nekrophant soldiers are fitted with armored exoskeletons known as Kataphraktoi armor; although visually very similar to the IR's knight armor (leading some to beleive that the two armors are different evolutions of the same ancestor) it is in fuction much different. Kataphraktoi armor is slower and is not as well armored as knight armor, however it is easier to build and maintain than knight armor and does not require the same level of extensive cybernetics to operate. In addition Kataphraktoi armor comes with a much larger and bulkier reactor to power the soldier's power-hungry plasma weapons, as well as an advanced onboard medical system that can deploy nanomachines and drugs to quickly mend wounds and repair damage^. Let's give them Republic gear that's been 'upgraded' with Colseran tech. Something like Hydra's super-weapons from the Captain America movie. Alien tech tacked onto existing human vehicles/armor/weapons. The bulk of the Nekrophants' military is composed of Kataphraktoi^^, clone soldiers in powered armor whose compentency and training can vary drastically depending on which vat factory they came from (some units are highly trained and drilled before being deployed, others simply pulled straight from the vat and given combat drugs and equipment); Kataphraktoi are designated as either Skoutatoi (standard line infantry) or Toxotai (gunners and heavy weapon crews). They are supported by the Kavallarioi (armored/mechanized units) and Psiloi (reconnaisance and special operations). One unique element of the Nekrophant military is their use of "reanimated" soldiers. After combat, recently killed enemy combatants are warpped in bandages containing a special cocktail of chemicals and nanomachines which temporarily restore function to the various vital organs of the victim allowing them to continue fighting, albeit in a reduced capacity. Informally referred to by IR soldiers as "Numbers" for the paralyzing effect contact with the bandages can have on living flesh, they are used by the Nekrophants as cannon fodder and a moving shield to advance behind. Let's say that their troops are clones of the loyalists that fled with the royal familie(s) X thousand years ago. Copies of copies that aren't quite themselves anymore. Especially copies of reanimated copies. * I recognize that West and East don't really make sense in terms of space cartography, its just a shorthand to make it easier to picture. We really should call 'East' Core-ward, or 'North' (towards the core). While 'south' would be spinward or just away from the core. But East and West work with the map I've done (top). ** The east and west followed different interperations/sects of the same religion. While the east embraced the original prophet's economic and capitalistic teachings, the west focused more on the prophet's religous and philosophical tenants. It was said that the west followed their prophets, and the east followed their profits. The prophets should be an Imperial Republic thing. It's what keeps them united. The kingdoms of the Fallen are only united in their hatred of the IR, and their use of Colseran 'assistance'. They kill prophets on sight. ^ONN and I originally had the idea of the core ifnantry being realtively lightly armored soldiers with carbines/SMGs and some form of large future-matierals shield (think an ancient/medieval style shield wall, but instead of spears or axes they use firearms and flamethrowers), with the Kataphraktoi serving as hevy infantry/linebreakers. This idea is currently not in because we couldn't find any models that fit that description. How about a core of elite troops (with good weapons), with cannon-fodder clones/reanimates for wave attacks?